I finally remembered to take a picture of my tattoo, with the help of some friends. It’s been around 7 weeks since getting my tattoo (5 weeks since finishing). 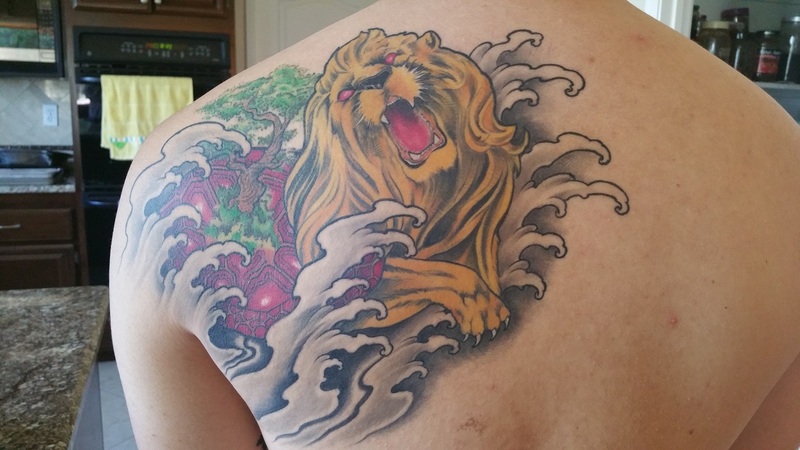 The idea of getting a lion turtle tattoo came to me a couple of years ago. I knew I wanted it to be my next piece. There were moments of uncertainty (“would ATLA always be important to me?”). Ultimately, I decided it had meaning beyond a tribute to one of my favorite shows ever. If you know me, you know I like to find meaning and symbolism in everything. Well, this tattoo holds a lot of spiritual meaning to me, which coincidentally, has been something I’ve learned a lot about this year. My own spirituality has been…I guess the word is “awakened”…throughout this year. At the basic level, it’s a lion turtle. In Avatar: The Last Airbender and The Legend of Korra, these mythical beasts were an important part of the earthly and Spirit worlds. I knew I wanted some sort of mythological creature; at one point, I really wanted a Vietnamese dragon. I feared it was too generic, that dragon tattoos were kind of bland if done improperly. A lion turtle, on the other hand, was the perfect mix of tribute, mythology, epicness, and originality. Of course, I’m a fan of killing two birds with one stone, and with tattoos, I always look to combine ideas. I decided I didn’t want a giant forest or a large city on the lion turtle, which is what is canonically on the shell of the massive beast (yeah, they’re that big). Instead, I wanted something meaningful- the Tree of Life, Yggdrasil, Eywa, the Bo tree. I like the motif of a tree of life; biology, philosophy, mythology; it represents an evolutionary phylogeny, an interconnection of all life forms, knowledge/wisdom. The water surrounding the lion turtle was a key aspect to bring the piece together. Not only is it a perfect border, but water specifically is definitely my element. Waterbender, water Pokemon, Slytherin (the river element). The lion turtle does not specifically have the waterbending markings on its forehead, but I thought that unnecessary. Let us not forget, water is the element of change. But y’know, next time someone asks what my tattoo is, I’ll just say it’s called a lion turtle and it’s from a TV show. We know the truth, though. It’s so much more than that. ~ by Btab on 8 September 2015.